Why the hold-up to change primary channels to HD? Sports fans waiting to see Grand Finals are once again out of luck, nine months after analogue television was switched off around the country. While Seven and Nine are required by the anti-siphoning legislation to screen the AFL and NRL grand finals on their primary channels, there is nothing to prevent them from simulcasting them on 7mate or GEM respectively. Premium sport along with other genres continues to be screened in SD while the industry and government are distracted by other concerns such as FreeviewPlus, Piracy and killing off Community TV. That’s despite Nine CEO David Gyngell telling media at the 2012 NRL rights conference games would be in HD from 2014. Nine does produce the NRL in high definition, which screens in glorious HD on FOX Sports. Viewers in Perth and Adelaide also get to see NRL on GEM, but where it really counts -Sydney and Brisbane- standard definition prevails. When questioned on David Gyngell’s position this week, Nine did not reply by deadline. Meanwhile, Seven doesn’t even produce its AFL in HD, despite it continually touting itself as a leader in sports broadcasting. Seven-produced games on FOX Footy are upscaled, but not to “full” HD. This week Mumbrella published a story that Seven Melbourne general manager Lewis Martin had ‘backflipped’ on a pledge to screen the Grand Final in HD. Of course if our networks had switched their primary channels to HD nine months ago (isn’t that why we all bought new TVs?) none of this would be a problem. We could watch premium drama, entertainment, documentary and news in HD too. But as FreeTV explains, networks can’t make that move under current regulation. Last December FreeTV wrote to Communications Minister Malcolm Turnbull recommending Legislative change to the Broadcast Services Act to drop the requirement that primary channels must be an SDTV service. “Under the current regulatory framework broadcasters are forbidden to show their primary channel in HD and under the antisiphoning rules listed sports must be on a primary channel unless you get permission to do otherwise,” said Free TV CEO, Julie Flynn. But while networks are awaiting regulatory change, what’s stopping them from simulcasting premium sport in HD now? Not the anti-siphoning list, which rules only that it must seek approval if it wants Tier A sports only on multichannels. Not OzTAM ratings, which allows networks to merge numbers where a content simulcast applies, a la Family Feud. No, it appears to be driven by money. Ad rates for Primary channels are around 7 – 10 times higher than those on multichannels. Victor Corones from MagnaGlobal said, “There is generally more available audiences sitting on the primary channels which also happen to be the more expensive channels from a rates and Cost Per Thousand perspective. I would also think that there a greater chance of catching more viewers if the show sits on the well-known primary channel. Meanwhile Free to Air viewers can look forward to two glorious standard definition finals across two weeks. Every year I go to a bar here in Toronto, Canada to watch the grand final on the big screen and it’s embarrassing how bad the quality is when everything else here is in HD. Even more embarrassing is we get the Channel 9 NRL games during the season live and in HD while you guys get neither. It is comical and pathetic that during the NRL finals, nine rams disgusting fried chicken, alcohol and gambling down your throat intermixed with some Harvey Norman ads for Ultra HD TV’s. How about you just show the games in HD nine, let alone Ultra HD. That’s not quite true. They could return to simulcasting their respective primary channels in HD if they wanted, just as they used to. But they prefer to keep Gem/Mate/One to maximise their audience and advertising opportunities. I don’t know know what WIN does with 9 simulcasted shows but its like watching 144p you tube video. Disgracefull. If multichannel ads can only be sold for small sums, this strengthens the economic case for simulcasting. The grand finals will appear on the primary SD channel. They will return a certain amount of ad revenue for this. If they are on a HD channel as well, there will be no (or very little) net gain in the number of people watching the program. So, without some creative arguments, there will be no additional revenue. And some additional costs. However, there will be little money lost from not screening alternative programming on the HD channel. If HD channel programs could return more revenue, then the chance of simulcasting would decrease. 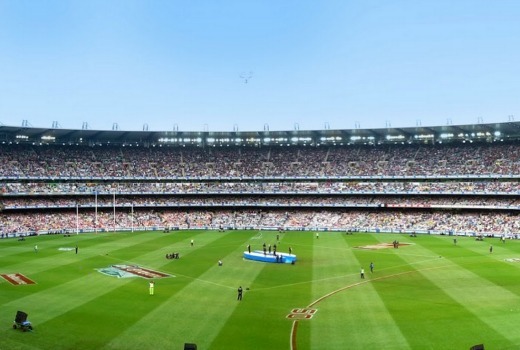 The AFL Grand Final – live and free and blurry on Seven. Surely any ad revenue during the Grand Final from 7mate would be insignificant as something like 97% of everyone would be watching Seven – so why not simulcast in HD with same ads. What’s crazy about it all is you can go to Fox Footy ch 504 and watch their countdown to their half time analysis in full HD. Over to you now, Nine – 8 days until NRL Grand Final (Rabbitohs vs hopefully Bulldogs) – make the change and simulcast on GEM. @michaeltv – The Digital TV spectrum is only VHF 6 – 12 and UHF 28 -51, UHF 52 and above is to be auctioned off for LTE (4G), the ones below 6 are used for Communications for Planes, Taxis and etc. Different areas use different blocks, for instance South Yarra, Ferntree Gully, Rosebud and Melbourne Inner Suburbs use UHF 40 -45, while Marysville, Healesville, Upwey, Selby use UHF 34 – 39 and other areas use VHF 6 -12. So none of the VHF 6 – 12 and UHF 28 -51 can be used for extra channels SD or HD (as well as those outside of those). This is why we’ve had the Digital retune recently, for instance when analogue went off SBS moved to channel 7 on Digital as analogue wasn’t there to interfere any more. Would it be possible for Freeview and Subscription TV to actually compliment rather than compete with each other? The primary channels could provide a free SD signal as they seem quite happy to do, but Foxtel and even up and coming services like Fetch TV could provide a simulcast in HD. There is potential there for the networks to recoup some costs. And in the reverse situation some of the Freeview multi-channels could be re-branded for Foxtel content, where first run/exclusive series to Foxtel can be run at a later date on FTA. With Ultra HD TV’s now prominent in major retailers both FTA ans STV need to gear up for the future before they lose their audience completely. Once 4K content becomes more readily available who is going to want to watch a poorly encoded 576i signal? Welcome to the 20th century, people. it looks like this country is stuck in it. Not only from TV perspective, but also from the Internet as well. What really pisses me of it retailers now pushing 4k TVs, that 4 times the resolution of Full HD and here we are unable to get HD on our most popular shows, yet another reason some go else where when it comes to US/UK shows. They need to change the rules to allow networks to upgrade to Full HD service. But in the mean time networks should simulcast premiere sports like the Grand Finals and Bathurst in a couple of weeks in HD. I guess they don’t want to ditch those extra shopping/data channels to make room for them. Ridiculous though – here in the UK the main FTA channels and their multi-channel spin-offs have been simulcast in HD for a few years on at least one platform. As a Perth sports fan, I feel that all Sunday AFL matches should be broadcasted in HD rather than SD. I’ve said it before and I’ll say it again, 7, 9 and to a lesser extent 10, continue to do everything they can to annoy their customers. The AFL and NRL need to take some of the blame here too. We know that 7 and 9 will never put the public interest first, so at the next rights deal, they need to contractually enforce the two stations to show all the finals in HD.